There is a well-known political commentator on a cable news network whose promotes his incredibly popular talk show as a “no spin zone”. Whether that is true or not isn’t what I’d like to debate (it’s “not” by the way), this is more about what the phrase touches upon. I believe it strikes a chord with many who feel like they’re always being told what something “is” or “isn’t” by the experts – people with titles, talk shows or a tome. Nothing is beyond being “spun”, not even Jesus. Unfortunately, more times than not the people I see “spinning” Jesus happen to be within the walls of the church. Some times I’m sure it’s been me doing it! 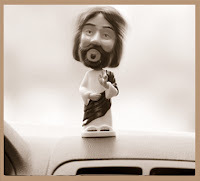 Instead of going deeper on that let me simply stop and offer a suggestion for those of you who feel like Jesus has been spun one too many times before your eyes (even, or especially, if it’s of your own doing). Read the Gospels for yourself, again. Just you and Matthew, Mark, Luke and John. Over the past week I’ve spent about an hour a day reading through the Gospel accounts and the one thing that stood out to me above all else is how my view of Jesus may need to be trimmed of some “spin”. For example, in reading about what Jesus said and did, I’m taken back by how often un-meek and un-mild Jesus acted. He was pretty tough to say the least, yet the popular picture often cast of Jesus is a person almost timid in character. But that’s just spin to make Jesus more accessible, distilled and disinfected for public consumption. I thought about sharing some supporting scripture references for you to check out but that would defeat the point of reading it yourself. Do it. Take one week or so and read through the Gospels in big chunks at a time. I don’t know if this is fast or not, but I read about fourteen chapters and hour which means I finish Matthew in two sittings, etc. When you read in big sections you get a sense of the emotional flow and timber of Jesus as he heals, preaches and moves toward Jerusalem. Every time I finished an account I had the same feeling: I’ve forgotten more of who Jesus is than I realized. So, read the Gospels by yourself. It’s good. It’s simple. It’s truly a “no spin zone”. Who knows? You might realize the Jesus you’ve known has more in common with what’s being spun today than the real thing? When it comes to Jesus, get to the Gospels; leave the spin to the politicos and pundits.